Beautiful Beachfront Condo. Panoramic ocean views. Sleeps 2. New & immaculate. Just steps til your toes touch the sand. If you enjoy quaint village shops & superb dining, romantic sunsets on private balcony, and twilight strolls on the beach, you will love Little Casa by the Sea. Private balcony, electric fireplace, free high-speed internet access, parking and more...... Please call for holiday rates. 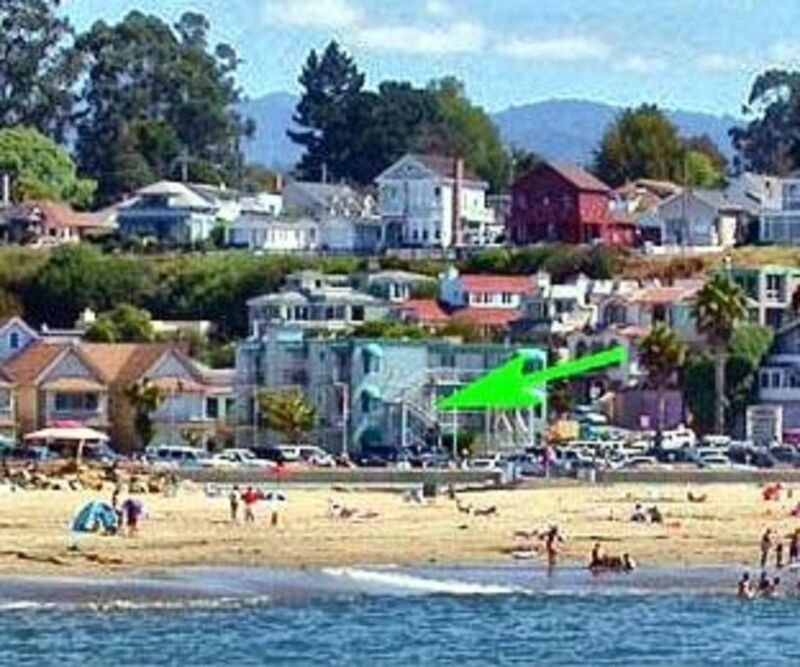 Little Casa is beachfront Capitola Village - just steps til your toes touch the sand.... Ocean and beach views from every window and both balconies. Such an easy and fun time! Pictures don’t do it justice of how close you are to the beach and downtown! Perfect little place for a couple. Sharon was so responsive and helpful throughout the entire process-easy check in and out. Bed was comfy too! Would definitely stay here again when we come back to Capitola. The room was charming, sand and aqua decor that looked great with the beach view out the windows. Porches in the front and back to breath in the sea air, steps away from shopping, sand and dining. Designated parking made the car part simple, and a comfortable bed. LOVE IT! Incredible Views, Close to Everything, and a Great Host!! I can't begin to describe how happy we were with this stay!!! The location and views are out of this world, and the place feels a lot larger than we initially thought it would. Good kitchen space, great living/sleeping area, and a nice restroom as well. We spent a LOT more time in the room than we thought we would, with views like that and all the activity below, it was hard to leave. We've already started recommending to others, and hope to stay again ourselves in the future. I won't even look at other options when staying in the Capitola area, this place is a no-brainer. Sharon was an amazing host as well, very prompt and kept in close touch leading up to our stay. This is a great gateway, studio is in a good location to enjoy the ocean view from front and back. Why 4 stars is because it can get noisy at night. Thanks Sharon for helping us have an awesome Aniversary memories. We’ll love to come back next time! A perfect place to spend a long weekend! Steps away from the beach, restaurants and shopping! Our studio was immaculately maintained! With a front porch and back balcony, you are surrounded by the beach! My husband and I have stayed here a few other times and as usual, this time did not disappoint. The location of this cute little unit could not be more perfect...right in the village and directly across from beach with views from three sides of unit. Sharon has thought of everything in stocking the unit - it is clean, functional and so comfy! the bonus is that parking is included! And this trip the weather was clear and absolutely beautiful! Can't wait to come back again next summer!